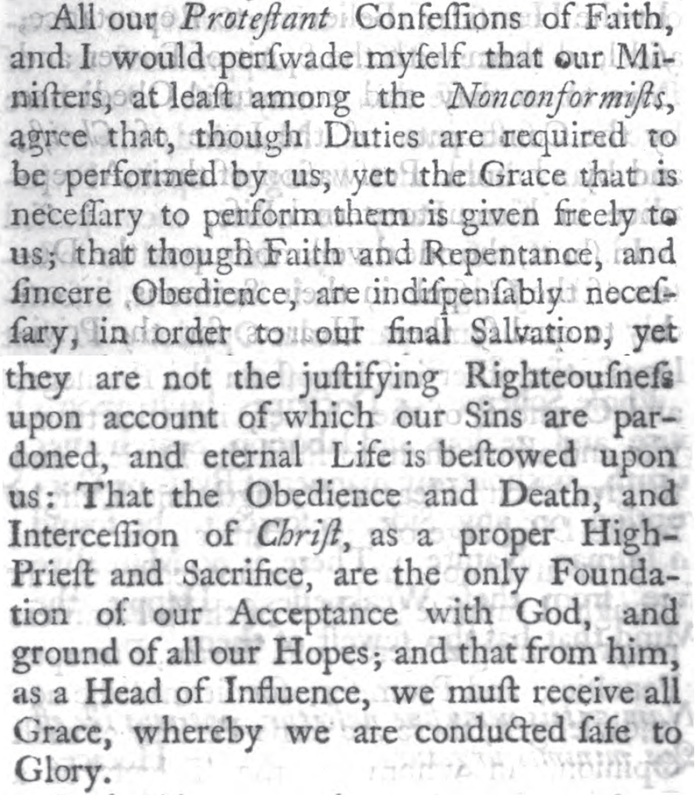 All our Protestant Confessions of Faith, and I would perswade myself that our Ministers, at least among the Nonconformists, agree that, though Duties are required to be performed by us, yet the Grace that is necessary to perform them is given freely to us; that though Faith and Repentance, and sincere Obedience, are indispensably necessary, in order to our final Salvation, yet they are not the justifying Righteousness upon account of which our Sins are pardoned, and eternal Life is bestowed upon us: That the Obedience and Death and Intercession of Christ, as a proper High-Priest and Sacrifice, are the only Foundation of our Acceptance with God, and ground of all our hopes; and that from him, as a Head of Influence, we must receive all Grace, whereby we are conducted safe to Glory. 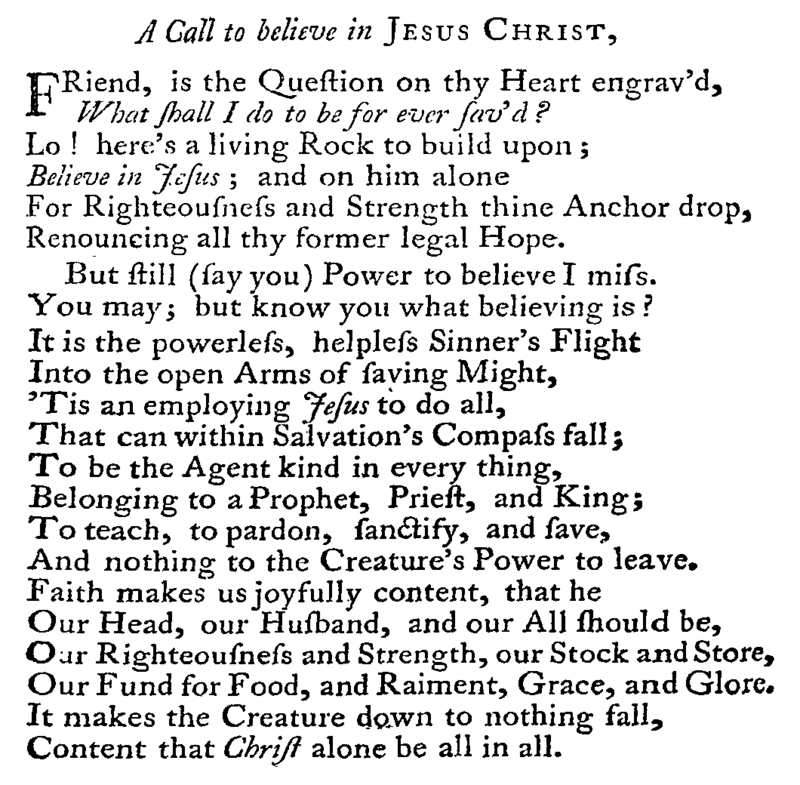 Isaac Watts defends the purity and truth of the gospel against its corruptors. It is sad that what Watts calls a “Deist” gospel is the standard “Christian gospel” of American life today (if that). And it is also sad that what Watts deemed necessary to defend is often given up without a fight or unconsciously accepted as “a simpler message.” At least the Deists had some conception of sin and forgiveness. But there have been some Persons in the last and in the present Age (I chiefly intend the Socinian Writers, and those nominal Christians who are leaning toward Deism) who would impoverish and curtail the Gospel of Christ, and make it to consist in little more than mere natural Religion. Some of these Persons just make a Shift to persuade themselves to believe the Bible, or at least they profess to believe it, because it is the Religion of their Country, but they explain it in so poor, so narrow, so dry, and insipid a Manner as raises it very little above the Light of Nature, viz. 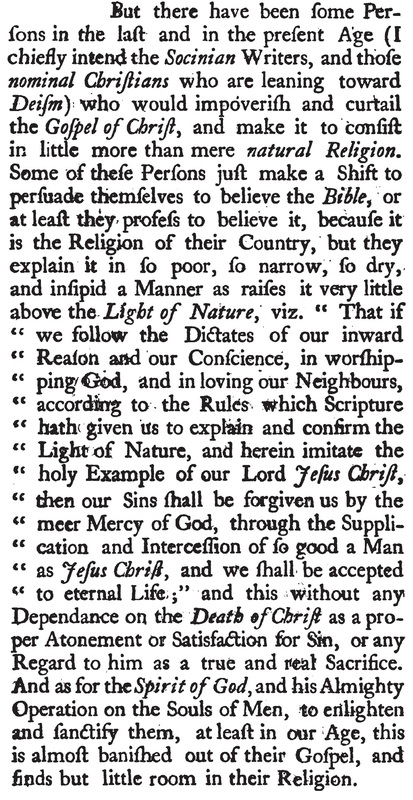 “That if we follow the Dictates of our inward Reason and our Consciences, in worshipping God, and in loving our Neighbours, according to the Rules which Scripture hath given us to explain and confirm the Light of Nature, and herein imitate the holy Example of our Lord Jesus Christ, then our Sins shall be forgiven us by the meer Mercy of God, through the Supplication and Intercession of so good a Man as Jesus Christ, and we shall be accepted to eternal Life;” and this without any Dependance on the Death of Christ as a proper Atonement or Satisfaction for Sin, or any Regard to him as a true and real Sacrifice. And as for the Spirit of God, and his Almighty Operation on the Souls of Men, to enlighten and sanctify them, at least in our Age, this is almost banished out of their Gospel, and finds but little room in their Religion.